When our oldest was just a year old, we were in a local bike shop and discovered our first “balance bike”. We honestly had no idea what to think of it and assumed it was just for tricks or some sort of sport that we had yet to be introduced to. We left the shop (over an hour later) with a full understanding of what a balance bike was and the conviction that they were the perfect way to start all kids on bikes. Before J turned two, we bought him a Haro balance bike (and a horn to make it more fun) and were more excited than him to see what he could do. He started out slowly, but took to it eventually. By 2.5 he was cruising on it. By 4 he was successfully riding a pedal bike. As parents we questioned if he would ever get the hang of it (we were definitely more excited about it than he was), but it happened on his own time. P had the advantage of watching his brother on bikes literally from the time he was born. However, he is small for his age and was inhibited by the fact that he couldn’t fit on even the smallest of balance bikes. When he was finally old enough, his start was slower, but when he figured it out he flew. And then he was on pedals before he was three and completely independent on pedals (starting himself, going up hills, etc.) just a couple months after his third birthday. These kids are knocking our socks off with their biking skills, but they are not anything unique – they’ve just been given the tools from an early age. We’ve seen the benefits of using balance bikes translate into many other areas of their lives. 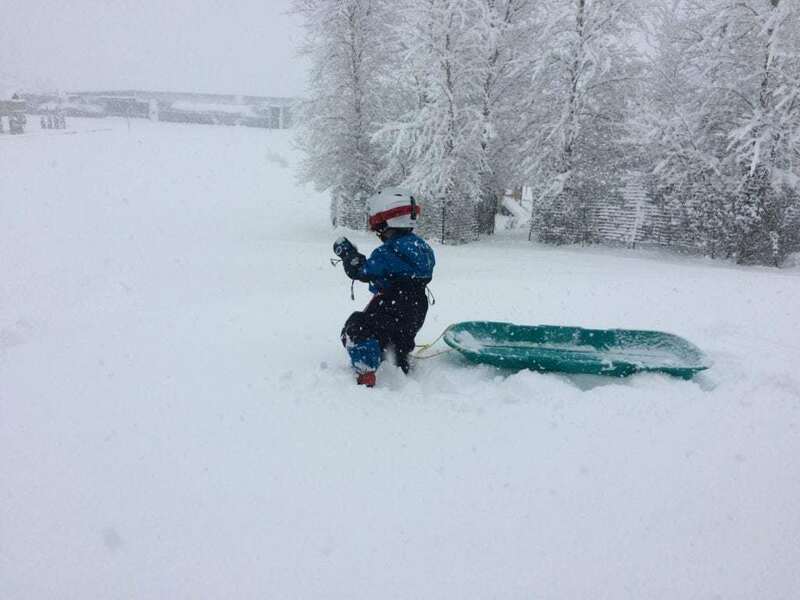 As young children, both boys have developed excellent balance for skiing, hiking, and Stand up Paddleboarding. Biking immensely boosted J’s confidence in himself and helped change his personality from a timid toddler to a confident and self-motivated preschooler. Mtn Papa and I both learned to ride bikes with the help of training wheels, as did most of our generation. However, training wheels actually do little to build the skills necessary to ride. They become an unnecessary crutch that prolongs a movement towards riding without training wheels at all. Since most of us learned to ride with training wheels, teaching our own children a completely different method can be a bit intimidating. It was definitely a learn-as-we-go process. Looking back on it now, though, it really wasn’t difficult. The balance that children learn by riding a balance bike is all they need for eventually riding a pedal bike. Training wheels only provide an unnecessary crutch during transition stages. 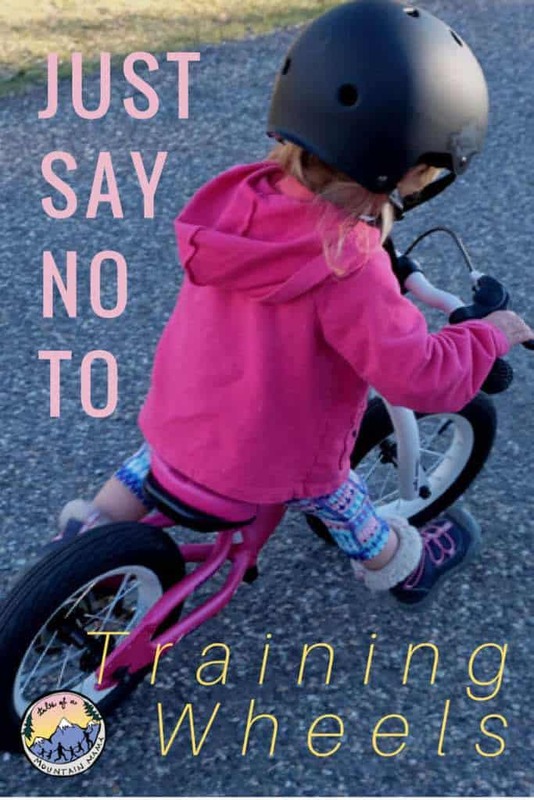 In fact, training wheels only teach children how to ride a bike with training wheels! It’s ok for kids to ride a balance bike until they are comfortable with pedals. They come in a variety of sizes to accommodate all ages of kids. If your child is not ready for pedals for 3 years, it is perfectly ok and normal. Strider bikes even makes a 16″ and a 20″ balance bike for kids aged 6+ and 12+ respectfully. They are for learning, for doing tricks, and for helping with balance and coordination for bigger kids and adults. Kids can start as young as they can fit on a bike and walk well (usually around 18 months). The progression is them walking while on the bike, then sitting down on the seat and walking, then running and balancing. There is no “right age” that it happens. Relax and let your child have fun. Any sort of pressure usually has adverse effects. The main goal is to help them love biking. Once they get the hang of it, children ride much faster on a balance bike than they can with training wheels. It provides them freedom of movement, an opportunity for independence, and continuing practice on their balance. The emotional benefits go much further than the bike. Skills learned while biking are not restricted to JUST biking. The balance training and strength transfers to skiing, climbing and stand up paddle boarding just to name a few. As a parent, there is much freedom for you too in the fact that they can keep up at a younger age while you walk/bike/run with them – you get out, they burn off some energy. But, how do they learn how to pedal? Many times the argument for training wheels or a tricycle is learning how to make the pedaling movement and strengthen their muscles. While there is some validity to that, both of our kids (and most of the others I know who learned in the same way) did not ever ride either. When you can put your child on a balance bike before they are two, there is no need for a tricycle. Remember that when they are walking/running on the balance bikes they are building muscles to do the pedaling. The balance is the hard part – pedaling comes when they’re ready and is much less of an obstacle than most people think. My kid just will NOT ride a balance bike! Get on a bike too. If they don’t see YOU biking, why would they want to? Monkey see, monkey do (AKA “Peer Pressure is a Beautiful Thing”): Get them around other kids on balance bikes. P picked it up much faster because he saw his brother and friends doing it. It’s great for them to see other kids riding pedal bikes too, but they’ll follow quicker when everyone is doing the same thing. Get out there a little bit every day. Even just 5 minutes. Making your biking time special family time or one-on-one with a parent time. Bring the bling – a fun horn or some streamers makes a huge (HUGE) difference sometimes. Silly, but true! Relax – they’ll do it when they’re good and ready. Help them foster a love of bikes (and therefore a desire to learn) any way you can. Using Trail-a-bikes or a WeeHoo is a great way to help the family continue to get out there. Finally, remember to model good biking behavior and enthusiasm. Wear your helmet every time (and be sure they have theirs on too from the very beginning.) Teach them traffic rules as you go (stopping at stop signs, etc.) by modeling and talking them through it. You can also just take the pedals off a normal bike for learning. It works, but spending ~$100 or so on a lighter, smaller balance bike is a worthwhile investment in our opinion. In fact, we think that it’s some of the best money you can spend on a toddler. 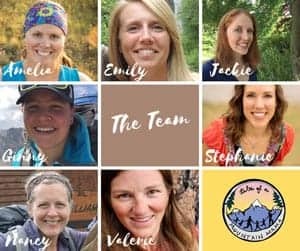 © 2014, 2019, Tales of a Mountain Mama. All rights reserved. Republication, in part or entirety, requires a link back to this original post and permission from the author. A day in the life of a little adventurer…. 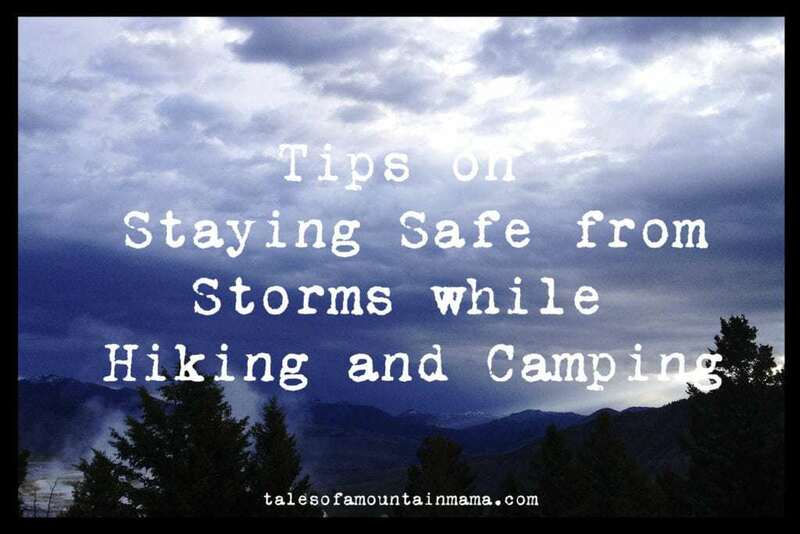 This is a very timely post today! Our nearly-4 year old son has been on a balance bike for 2 years now, and he seems completely ready for a pedal bike. We borrowed one from some friends this weekend, and let him have a go on it. I figured he would just take off, but he did REALLY struggle with the peddling. He is staring at his feet the whole time, and that makes riding forward difficult. Any suggestions on how to teach a kid to pedal who never has?? Thanks! I would say just give it some time. My son had trouble the first couple of times we went out. He got frustrated and each of our “outings” lasted less than two blocks. I would help him balance while he got his feet on the pedals and we talked through the motions. Then it poured for two weeks so we didn’t bother going out. The next time we went out he needed help getting started each time he stopped (which was a lot) but we biked over a mile to a playground and he loved it. Two weeks later he taught himself how to start off by himself. Now he loves to ride everywhere and he’s so independent! I love it. Thanks for chiming in, Emily! And reminded me that them actually starting on their own can take much longer than the initial riding on their own. It took both my boys months actually! Kate – I agree with what Emily said. It really does take time and a lot of patience MOST times. P (who was riding a pedal bike before he was 3) was very slow about it for a frustratingly long time. Best tips I can give are time, patience and get him around other kids on balance bikes if you can! Also, maybe run in front of him and have him look at you (even maybe hold out a fun toy or balloon or something so he is looking forward?) Finally, take 5-10 minutes every day on the bike (and make it one-on-one parent time if you can!) – he’ll get it!! My daughter is almost 6 and she has had a balance bike since she was 18? months. She rode it for a couple of years but never got as good as many of her friends. She has always been super cautious and would not lift her feet up totally. Her best friend learned to ride pedals without training wheels this last year and she finally decided that she is ready for that. So we got out a 2 wheeler and within a couple of minutes she was riding. But within that week she became so scared she is going to fall that she now won’t ride. I got her knee pads/elbow pads etc but she still will ride for 2 seconds then put her feet down. She much prefers our neighbour’s bike with training wheels or riding her brother’s (her old) balance bike. I’m thinking of just giving it time and perhaps a new bike (the bike is old and heavy and I’m not sure if it fits her right) but any other advice would be really helpful! Finally, check out biking gloves for her. If she DOES fall, they help immensely!! My almost 5 year old daughter is very cautious too! She doesn’t like the feeling of being out of control or wobbling at all. I am really active and don’t have a cautious bone in my body when it comes to trying new sports, so imagine my surprise when my little person threw her bike across the driveway and said “I hate biking” at two years old, three, and again at four! We have opted to not push her and have just reintroduced the balance bike AND the training wheel bike every once in awhile over the past couple of years. She still hasn’t taken to the balance bike and won’t actually even sit on it, but this summer she started peddling around the neighborhood on her training wheeled bike and enjoys it in short spurts. Yes, it is very possible that it will be a slower learning curve to drop the training wheels when the time comes, but honestly I just want to see her having success at something physical and I try not to get hung up on all the details. 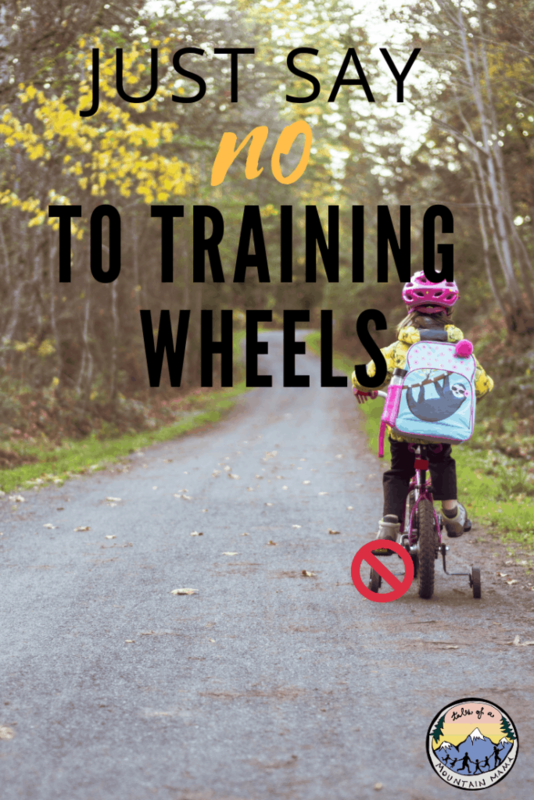 I know this post is all about no training wheels but I do have to say that all children are different and that I believe the most important aspect of the learning process is that it is FUN for your child! Training wheels, no training wheels, trail-a-bike, wee-hoo- no matter…just let it be fun. My oldest son was very nervous on bikes and we did try training wheels. But, they were a failure. What helped him gain confidence in his balancing skills was using a scooter for a while before getting back to his bike! We are struggling with this right now. Problem 1 is that the other boys have training wheels. My son’s best friend has pedals and training wheels so that’s what he wanted more than anything and begged and begged for it. He currently has his balance bike and his ‘big boy bike’ which does at the moment have training wheels. We alternate outings between the two, and I’ve been talking up how exciting it is when he gets to take off the ‘little wheels’ and just ride with the big wheels. But this transition is definitely tough. Could you share which pedal bike you have for J? I am just going to buy one for my 4 year old daughter transitioning from strider. Hi Christine – sure! Both boys are currently on Specialized bikes. They aren’t the lightest out there, but the components are great and sure beat the $20 WalMart bike. P is also small (at age 3) and he could straddle the Specialized (they have a lower center of gravity and geometry which makes a HUGE difference.) We highly recommend them. 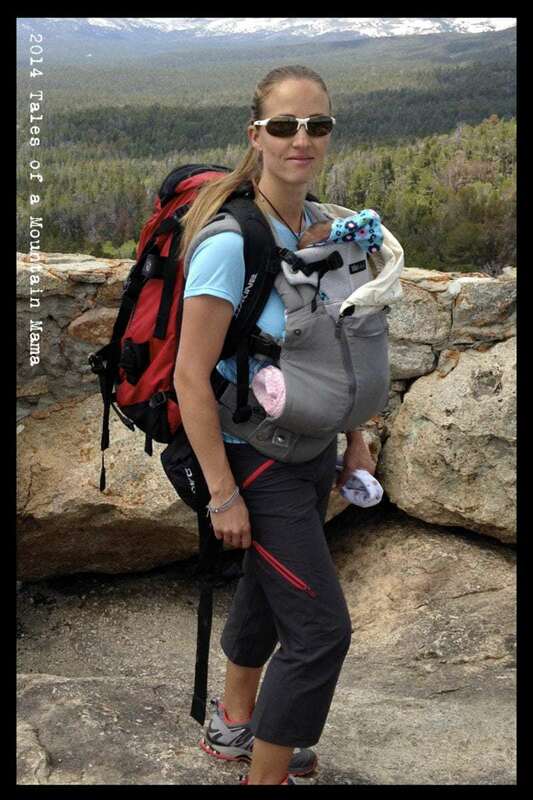 So P is on a 12″ HotWalk and J is on a 16″ HotRock (our review of that here: https://talesofamountainmama.com/2013/07/biking-gives-kids-wings-specialized-hotrock-review.html). Let me know if you have any other questions! 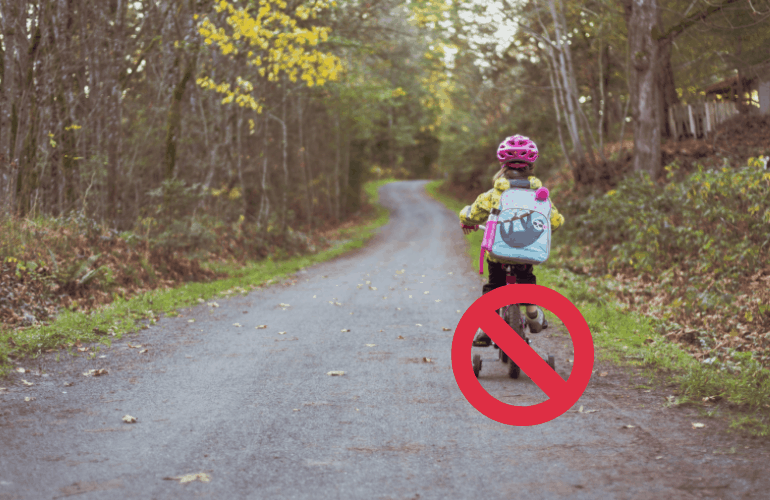 Kristen – yes, I think there are both sides of the coin (and agree that balance bikes are NOT the answer for EVERY kid.) But, since he is so young, I would highly suggest starting him with that! Plus, it’s fun for his older siblings when he can keep up with them too 🙂 Thanks for your input!! My kids learned on balance bikes. My daughter was uninterested in the Strider we got her, and my son found it in the garage when he was old enough to start riding it. He learned to ride a bike before his older sister. My son started on a Strider, my daughter started on a Specialized Hotrock 16 with the cranks removed that I eventually rebuilt into my son’s little yellow dirt jumper mountain bike. We are an avid biking family, and my kids are very strong riders now. I tell everyone that balance bikes are the only way to go. Here are a few videos that show some progression. The first is old, the second shows what a kid can do on a balance bike, even after he is riding a pedal bike, and the third is at the beginning of the summer. My son is an even stronger rider now, I’ve just been too busy to edit the recent video I have of him. The last is a video of a pretty famous rider killing it on a balance bike. Balance bikes are definitely the way to start your kid out as a rider. Thanks so much for sharing, Lee! Here is a post I wrote last spring about getting the right bike for your kid. Not about balance bikes, but is more info for those commentors above talking about buying pedal bikes. Mostly this info pertains to the 4-6 year old kids, but the ideas can be extrapolated to older or younger kids. Keep on commenting and feel free to respond to some questions posted here too! Thanks! I never even thought of leaving off the training wheels! A balance bike will probably be among my future purchases! I cannot believe how timely this post is for me! I have been going back and forth about whether to buy my 2 year old a tricycle or a balance bike for Christmas. I happened upon a used balance bike and bought it because I couldn’t pass up the deal, but I was still slightly second-guessing myself (I think because I always pictured her riding around on a little tricycle…) but your article really helped me see that I made the right choice. I can’t wait to give it to her! YEA! Now THAT is the comments I love to hear! 🙂 Please keep us updated as to how it goes! With my first child I put away tricycles and other bikes to focus him on using the balance bike(just a few weeks)Then after a year of using the balance bike he had strong legs and could go fast and balance. I felt like giving him the opportunity to explore the balance bike with out distraction showed him the possibilities of a balance bike compared to the other ride on toys we have. About the range of sizes, are the larger ones for adults? That is someone over 5 feet tall? Hi! I just discovered your blog and love it! I had been looking to see if anyone else introduced a pedal bike to their kid before 3 and it sounds like you have. My almost 2.5 year old flies on the balance bike. Do you have any recommendations for a well-built small bike for the under 3 set? Thanks!! Good information. I had no idea. Neither my three or four year old has had any success with a balance bike today, but maybe I should try again! It really does depend on the kid….but peer pressure REALLY helps sometimes! Yes! To all of this!!! My husband doesnt agree with me! He just can’t comprehend why balance bikes are better than training wheels!! Totally get it….share the post with him and feel free to have him or you email us with questions! Seriously game-changer! I love that my (not so independent) 4-year-old daughter feels very confident and independent on her balance bike. I think a balance bike allows for mastery of small skills along the way, whereas it’s kind of all or nothing with training wheels. She has moved at her own pace from just walking on the bike to getting longer strides to gliding down hills. It’s so awesome to see her take charge of her own mastery and be proud of what she can do! I want to get one for my kiddo and even asked both grandparents for one, only to end up with two horrible tricycles. I thought the guilt of selling them to buy a balance bike is too strong. ..but after reading this article I really think I should! This is brilliant. Why bother when they can use their own intuition and skill! I think learning to balance on a razor scooter is also helpful. My daughters were wicked fast on those at ages 3-4 and were riding at 4. The strength part came later but they had no problem balancing the bike. One useful thing if balance bikes are a worrying expense – you can create what is essentially a balance bike by removing the pedal-related hardware (crank, gears, chain). I’m not very used to doing any serious maintenance of my own, but our community bike centre not only provides stands, but assistance with repairs, and the person staffing the centre the day I went was quite happy to help me convert the bike. This obviously works better with a bike with a hand brake, but the one we used didn’t have one, and my daughter just stopped with her feet. The one issue with a balance bike is that if you have a lot of hills it can be iffy. My daughter would happily ride her bike with me, but if we had to come back uphill we generally ended up hopping a bus for the way back, because she just couldn’t get enough momentum to glide any distance up the hill, and the return trip would essentially be her walking while sitting on a bike. She has no issues with hills now (and never did if she went out with her grandmother on a trike), so I’m fairly sure that pedals are a good solution for steep hills. I’m only 31 and I feel old now, I had to google balance bike. It’s an interesting concept and I think it really depends on the child… I had training wheels as a kid and transitioned to a bike with no training wheels without a problem. But I was also a very independent kid. This is a great alternative solution. We have just started our daughter off with a balance bike, the initial learning curve is a bit steeper but I know she will get more fun and enjoyment out of it in the end. Also, I can take her down to the skatepark and let her roll around on the little ramps, how cool is that?